The Iris hot tub one of the larger square spas in the offering by Garden Spas. 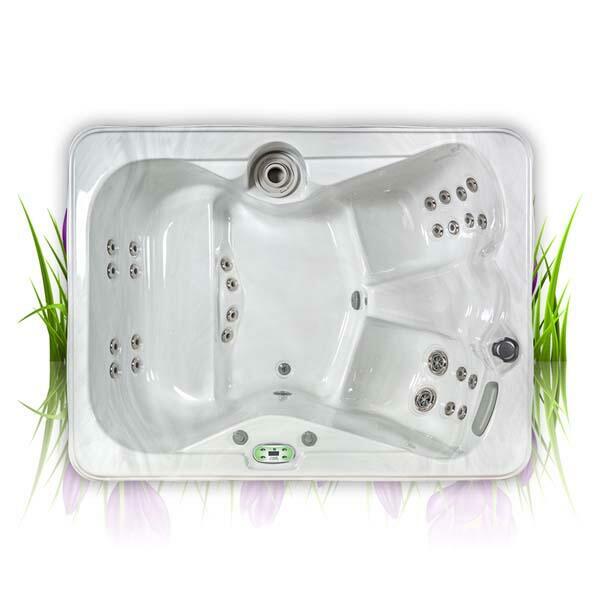 Garden spas are compact and easy to setup and operate. The shell is equipped with 27 jets that give penetrating massage to four seat positions. For comfort, the four seats are ergonomically designed to contour to the body, and one built-in LED light offers ambience and visibility during nighttime. For dependability, the Iris has leak-resistant plumbing, a deluxe safety cover, resilient Kingwood cabinetry, and double layered insulation. Garden Spas come with a series of upgrade options, including the option to add full coverage insulation, multicolor LED lighting and the revolutionary Ozonator water treatment system. Customize the style of the hydrotherapy pool with your choice of six outer cabinet colors and four inner shell designs.